Three sisters live together in an old house in a beautiful coastal town. 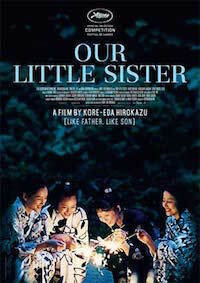 When their long-absent father dies, their teenage, orphaned half-sister comes to live with them. Different in personalities, but sharing a strong bond, they begin a new life of joyful discovery, despite the shadows of their family history. Boasting four superb performances and an abundance of traditional Japanese cuisine, this sensitive, poetic and heartening tale of love and family ties is an utterly absorbing pleasure from start to finish. Highly recommended to anyone who was moved by Brooklyn’s gentle, thoughtful drama.